Some humans can see the fae. McKenzie Lewis can track them, reading the shadows they leave behind. But some shadows lead to danger. Others lead to lies. A Houston college student trying to finish her degree, McKenzie has been working for the fae king for years, tracking vicious rebels who would claim the Realm. Her job isn’t her only secret. For just as long, she’s been in love with Kyol, the king’s sword-master—and relationships between humans and fae are forbidden. But any hope for a normal life is shattered when she’s captured by Aren, the fierce and uncompromising rebel leader. He teaches her the forbidden fae language and tells her dark truths about the Court, all to persuade her to turn against the king. Time is running out, and as the fight starts to claim human lives, McKenzie has no choice but to decide once and for all whom to trust and where she ultimately stands in the face of a cataclysmic civil war. I purchased the Shadow Reader after reading a delightful review some time ago and this sat in my TBR pile until I found myself in the mood for a good urban fantasy. Williams takes us to Houston and to the realm of the Fae. The tale is filled with battles, a love triangle and characters you cannot help but fall for. I was immediately swept away. McKenzie Lewis is human and a shadow reader. She is able to read the shadow of a Fae as he fissures out from this world to the next. She is invaluable to the King and has been tracking vicious rebels for him since she was sixteen. She has also been in love with the king’s sword-master Kyol. There love is forbidden and despite a few stolen kisses they have honored the king. The rebels discover McKenzie’s whereabouts and despite Kyol’s efforts she is kidnapped. Aren the smexy rebel leader whisks her away to a safe house within the realm outside of Germany. McKenzie’s world is about to get turned upside down as Aren teaches her the Fae language and shares with her truths about the Court. Things get really complicated when she begins to develop feelings for Aren all while trying to make her escape. The tale was captivating, the romance complicated and the world of the Fae mesmerizing. Told from McKenzie point of view and despite some annoying moments we get inside her head. She is smart, fiercely loyal and hilarious at times. The conversations in her head had me giggling more than once. Her soul has been damaged in this awful war and her life put on hold. Her feelings for Kyol have kept her from moving forward. I hate love triangles and my stomach did a flip-flop when I realized I was smack-dab in the middle of one. McKenzie has crushed on Kyol since forever and he has ruined her for mere humans. He is kind, sweet and gentle. They have had beautiful stolen moments, but never gone too far. His first loyalty has and always will be to the king. I liked Kyol. He is smexy, protective, and moves like a god with a sword. Now, Aren is a rebel, he loves his people and he is immediately attracted to McKenzie. He tries to teach her and show her their side of the war. They desperately need information she has, but Aren chooses to allow her to make the choice. I really liked this about him and felt his feelings for her are genuine. Their relationship progressed slowly and we were sparred insta-love. Who did she pick? Read and see. We meet many different Fae and each was unique and added to the tale. There was a couple who stood out and I became swept up in their side stories as well. The world-building in Williams universe was stellar and I found myself completely enthralled. The Fae court, the rebels and the realms were all spectacularly portrayed. The effect of technology on the Fae was interesting, as was the hierarchy. The interaction and reaction that occurred when a human and Fae shared an intimate moment was ooh-la-la. I am looking forward to learning more in the next novel. From the beginning we realize that McKenzie has been trained that the court is good and the rebels are evil. We also discover they have kept things from her. I cannot help but wonder if she would have questioned things more if Kyol was not a part of the equation. The McKenzie, Aren, Kyol triangle was complex and felt genuine. It created angst and kept me on edge. The pacing of the novel was delightful with its ebbs and flow. It allowed me to catch my breath and appreciate the world around the characters. The ending tied things up nicely, and while there is still much to be done and the pockets of the war still continue we get some closure. 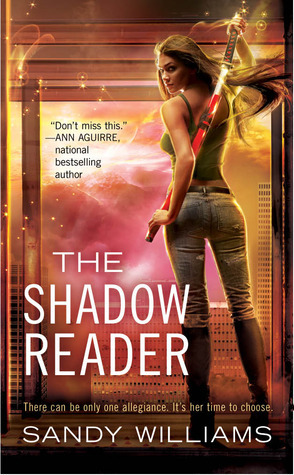 I recommend the Shadow Reader to fans of urban fantasy, Fae and high end fantasy. I am looking forward to reading The Shattered Dark the next book in the McKenzie Lewis series. Fab review, Kimba! I admit I wasn't as swept away by this book as you, but it just shows that the taste differs. The world setting was fascinating, I just didn't feel for the characters. Hope you enjoy book #2 just as much! I love me some fae, and I am excited that you said the world building is great. I trust your world building judgement since I know that is a big thing for you. Plus I really love the cover. I have seen other covers in the same kind of style but I like this one a lot more than the others for some reason. I remember when this came out that I wanted it. I better make sure it's not sitting on my shelves downstairs before I run to B&N and buy it b/c I love my fae stories!!! Awesome review - I'm glad you dug this one out for us!!! That is so cool Naomi and yeah the instant love can make ya pull your hair out, it only works one out of ten times. Now this looks like my kind of book!!! I really like love triangles, you don't really know what will happen. The instant love relationships annoy me more. I'd rather the guessing game... who will she choose? Great review, definitely adding it to my list! !